The Sportmax Collection for Spring/Summer 2014 has me lusting for Summer. Fluid shapes and flowing materials enhanced the notion of feminine beauty, garments which drape and flow around the body. A delicate colour palette further reflected the femininity and softness of the collection. Polka dots featured heavily throughout the collection from smaller, graphic styled dots, larger leather dots on sweaters, to transparent silk dots and larger, more dots forming panels in tops and dresses. It exudes a relaxed, feminine and effortlessly chic look which I cannot get enough of! One of my favourite pieces was a knee length white pencil skirt with a black polka dot mesh overlay. I love 'layering up' and mixing textures. The design is relatively simple with a striking look, a garment which can be styled in many different ways. This DIY is my take on said skirt. A relatively quick and simple DIY that can be adapted to your preferred length and polka dot preference! On this occasion I purchased a new skirt to adapt for this project but a thrifted, second hand skirt would also work well. It was really difficult to find a black net-like fabric with polka dots on, but I managed to find a great alternative. The first step is to get the base layer of the skirt to the length you want it. I opted for a knee length skirt and simply measured, marked and cut the skirt to the correct length. You may want to hem this layer, but I opted to leave it with a raw edge as the jersey fabric will not fray. Position your Polka Dot fabric over your white skirt to determine how you want the dots to lay and how long you want your Polka Dot layer to be. Lay your skirt onto some paper in order to trace around it and form a pattern for your polka dot layer. As you are sewing a non-stretch fabric to a stretch fabric you will need to allow extra room when cutting out the polka dot mesh. I added 1" onto each side of the pattern. Remember to mark onto the pattern the length of the white skirt and then add on the extra length that you want the Polka Dot mesh to be. Position your pattern onto the Polka Dot Mesh fabric, taking into account where the pattern lies and where you want the Polka Dots to sit. Once you have cut out one skirt piece, use this to cut out the other. This will help you to see where the pattern is and match up the front and back pieces if necessary. Once you have the front and back pieces cut out, pin them together down the side seams and stitch together using a straight stitch on your machine. This bit is a little fiddly but will help to give a neat finish. Turn the polka dot skirt inside out and slip over the top of the white skirt near to the waistband. This means that the right sides should be facing each other. Using a zig-zag stretch stitch, sew the polka dot fabric to the white skirt as close to the waistband as possible. You will need to pin in a few places, matching up any seams and then stretch the white skirt slightly as you sew. Trim away any excess fabric to prevent it from showing through on the right side. Pull the polka dot layer down over the white skirt to reveal the finished look. I fell in love with pretty much everything from Christopher Kane's SS 2014 RTW collection. I'm not massively into floral prints myself but this flower based collection changed my opinion somewhat. I loved the mix of fabrics, science-book-like flower illustration prints, petal shaped cut-outs and the pastel and metallic colour palette. Among others, one of my favourite pieces was the mint green sweater with 'Flower' emblazoned across the chest. The chunky bold lettering made delicate by intricate white lace making up the word. This seemed like the perfect idea for a DIY! I already had a plain sweatshirt that was in need of a makeover and my ever-growing fabric stash was in desperate need of shrinking. 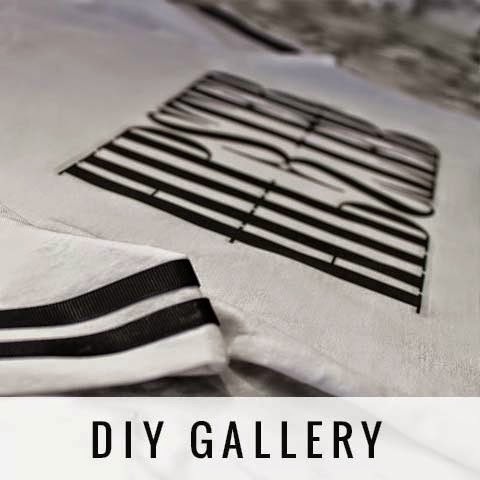 This is a relatively simple and straight forward DIY that can be adapted for any colour sweatshirt and any word of your choosing. There are only 2 materials that you will need for this DIY but you will need to have, or have access to, a sewing machine. I had a white sweatshirt so decided to go for an all-white design as I already had some Broderie Anglaise fabric that I could use. Firstly you will need to decide on a word and font style for your sweater. I, Ironically, chose the word 'word' but you can come up with something more suited to you. The next thing is to decide on the font. I played around with a few in Illustrator until I decided on one I liked. You'll need to pick something quite bold and boxy as it will be a lot easier to cut and sew. Print out the word and cut out, this will let you see what it will look like in fabric and will also be your pattern. Once you are happy with the font and size, you will need to pin the pattern pieces onto the fabric and cut them out. Once your letters are cut out, pin them to the sweatshirt in the position you want. One by one, sew the letters down by using a zig-zag stitch. I programmed my machine to make the stitches close together so that all the raw edges would be secured. I had already sewed the D down in place before I discovered that it needs some stabilisation behind, so my letter 'D' is a little wonky! Stitch and Tear is great but I didn't have any, so I just used plain white printer paper. This just helps the stitched stay neat and stops the sweatshirt fabric from moving and stretching too much. Carefully, snip the sweatshirt fabric away from the letters. This will reveal the fabric letters that you have sewn on. Continue until all the letters have been cut-away and turn your sweatshirt out the right way. overall, I'm pretty happy with the finished item, the jumper is a size too big really but I was trying to use things I already had. I'm definitely going to make another one in a smaller size and maybe experiment with different fabrics, maybe organza or a delicate lace. This sweater is super cosy and not too heavy, so it's perfect for a British summer. It's perfect for throwing on over a top and shorts after a day at the beach, when you're feeling perhaps a little toasted and tired. I've been making this cheesecake for the past couple of years and it seems to taste better every time. It's the right amount of sweet without the sickly rich chocolate hit, and is super easy to make. When we've had friends or family over for dinner, I've often served this up for dessert and it ALWAYS goes down well. What's great too is that it freezes well, so I often make double the recipe and freeze one for a later date. Serve straight from the fridge for optimum taste sensation! 1) Blitz or bash your biscuits until they resemble fine crumbs. 2) Melt the butter over a low heat then mix into the biscuit crumbs. 3) Tip the crumb mix into your cake tin and press firmly to create an even layer. Chill in the fridge. 4) In a large bowl, beat together the cream cheese, icing sugar and vanilla extract until it forms a smooth, lump free consistency. 5) Add to this the Nutella and beat until thoroughly combined. 6) In a separate bowl, whisk the double cream until thick, then add to the Nutella mixture. 7) When all the ingredients are thoroughly combined, pour onto the biscuit base. 8) Top with decorations of your choice. I often top with white chocolate curls but opted for an arty 'doodle' this time round. I made 2 and a bit times the recipe this time, making 2 large and a few individual cheesecakes. All of which were popped straight into the freezer, ready for when we have guests visiting in a week or so. I just leave them in the tins and freeze them like this. When you take them out, let them defrost for an hour or so then remove the tin and it's ready to be served. Following on from the DIY Pyramid Beanie Stud Hat, I've come up with another quick fashion fix for your winter woollies. Adding embellishments to a plain and simple Beanie can really make a big difference and add a bit of 'pizazz' to your outfit. This DIY is super simple but, I think, really effective, and you can personalise it by choosing different colours and designs of beads. The flower Bead Caps come in a cone type shape, you will need to flatten these out a little. I used the back of a coaster to press down on mine and that did just the trick. Once you've flattened out all your flower beads, you'll want to lay them out on your hat to determine which pattern you want to create. Once you've worked out your design, it's time to sew them on. Take your black thread and double thread it through your needle for extra security and strength. Working from back to front, thread the needle through the centre of the flower cap. Then go back down through the centre of the flower cap. Repeat this step so that the bead is threaded through twice. Secure on the back by knotting a few times, then snip the thread. Repeat this process until all your flower caps have been sewn in place. Copyright RENIQLO. All rights reserved.